So I've moved on to the next three minutes of editing happy happy joy joy hurry-up-and-wait; while not doing audio (which requires lots of headphone wearing), I get to have something rolling on the tv in the background for those joyful 30 minute stretches when the Mac is rendering all the color correction and manipulation I'm doing. 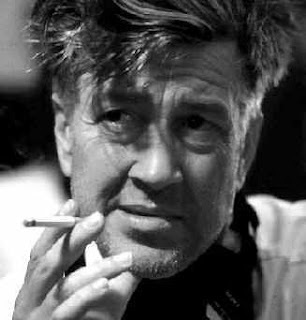 This week: David Lynch. I started off with Twin Peaks: The Complete Second Season, having watched the first season a week ago. While I fully accept my membership as a former "Peaks Freak" from back in the day (ah, college...), it's been a bit of a disappointment watching these episodes for the first time in 17-18 years. While the first season was damn near brilliant, season two jumps the shark with the solving of the murder of Laura Palmer. Every episode after the culmination of the mystery is a pale imitation of what Twin Peaks was supposed to be. Not that there weren't some great moments: Billy Zane's star was created in season two, looking like a young Marlon Brando. David Duchovny plays a DEA agent in drag (and more animated than that FBI agent he would embody two years later), and Lynch's directing and writing of the "bite me, you ABC fools!" finally was an inspired flipping of the bird to network brass. But, for the most part, Twin Peaks' second season (post Laura Palmer) was sad because it became that which it had mocked so well: a crappy soap opera. Next I watched Inland Empire. Three hours of a barely-scripted Lynchian universe where Laura Dern goes from normal to absurist puppet in... hunh. Not as fast as the viewer would like, actually. Inland Empire has moments of brilliance draped in curtains of tediousness. I can't tell if it's Lynch dipping back into the experimental nature of film, or if it's Lynch dipping back into the well of his already well-known bag of tricks. Dern is unfortunately miscast in this piece; while she undoubtedly knows the short hand needed to work with a director like Lynch, she too seems to be re-hashing her acting crutches (most notably her ability to cringe. Don't get me wrong, cringing is a tough thing to sell on film. However, we've seen that from Dern, like... a thousand and two times). There's a lot going on with Inland Empire, but most of it seems to be coming from Lynch's discovery of a new toy to play with: the digital camera. Not my favorite Lynch movie, but fine enough to have playing in the background while waiting for FCP to finish rendering. Finally, I let spin the latest release of Eraserhead, Lynch's first feature-length film. It took Lynch almost 6 years to get this sucker finished (which makes me look speedy by comparison), and it's still as convoluted, confusing, and brilliant today as it was back in the '70's (or '90's, when I first saw it on a bunk VHS). A GREAT film, a testament to the use of absurdism in film. Salvador Dali would have been proud of Eraserhead, as it is the legitimate offspring of his Un Chien Andalou. Whoops. Render is done. More next time.